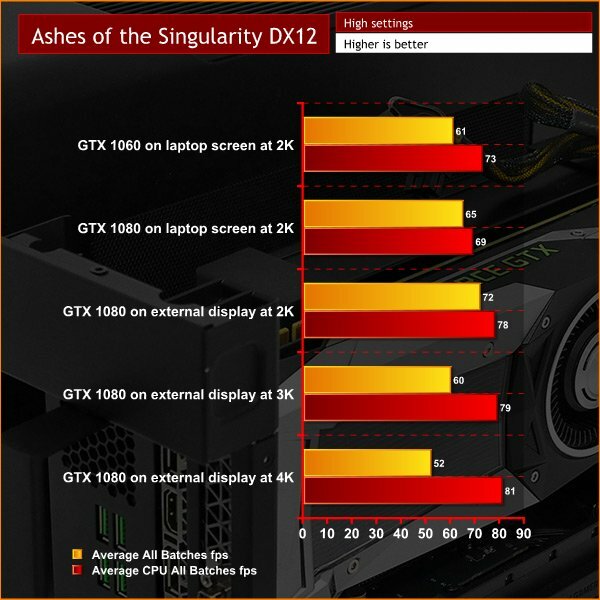 Latest reports says Gaming Laptops sales will be up to +20% this year, based of ours benchmarks here in eGPU.io you can see that eGPU market will be +100000% for sure... but why? I have an ax to grind with that first graph on account of the scale being so off due to the Y axis not starting at zero. Other than that, excellent collection of info, and like I was saying a long time now: eGPUs (actually, eEverything) is the future. The desktop will die out entirely, or at least change its form significantly enough so that it won't be the tower we are familiar with today. I am still waiting for the lightweight 12/13" laptop with a high-end quad-core CPU (or heck, bring-on mobile hexa-cores, hehe), but no dGPU at all. Coupled with an eGPU solution that makes for a lightweight and powerful machine for work and daily use, but an excellent system for gaming when docked. No, it won't weigh 2lb on account of having to account for a beefier cooling solution, but it won't be the 4-5lb monsters we drag around today to enjoy the high end CPU lines, and it won't have the unnecessary dGPU that becomes dated 1-2yr down the road and is essentially dead weight. I do wonder when Thunderbolt4 is going to roll about. 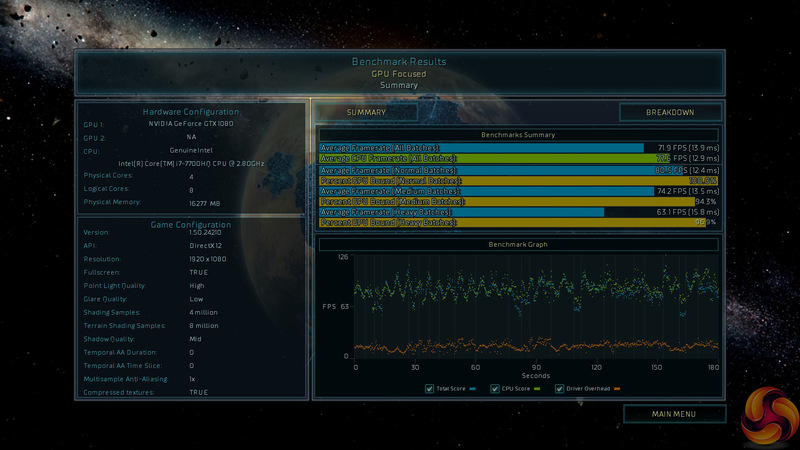 PCIe Gen4 should launch this year. Thank you for a very comprehensive summary. 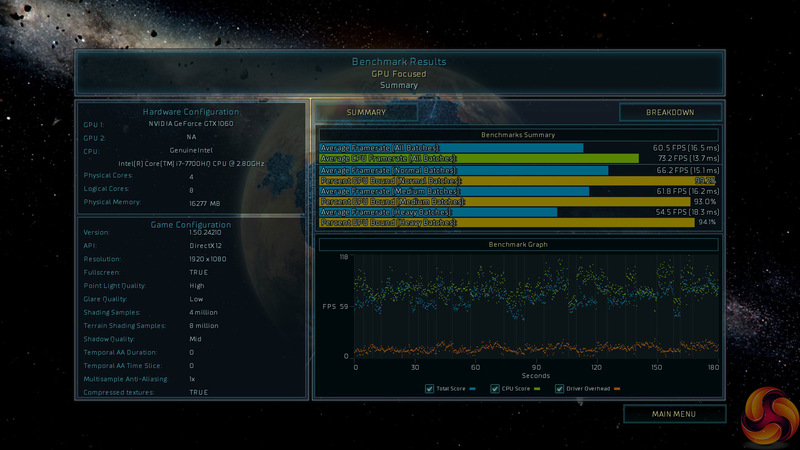 Thought to post some success with the MBP 2016 with Razer Core + Titan X Pascal in Windows Bootcamp. 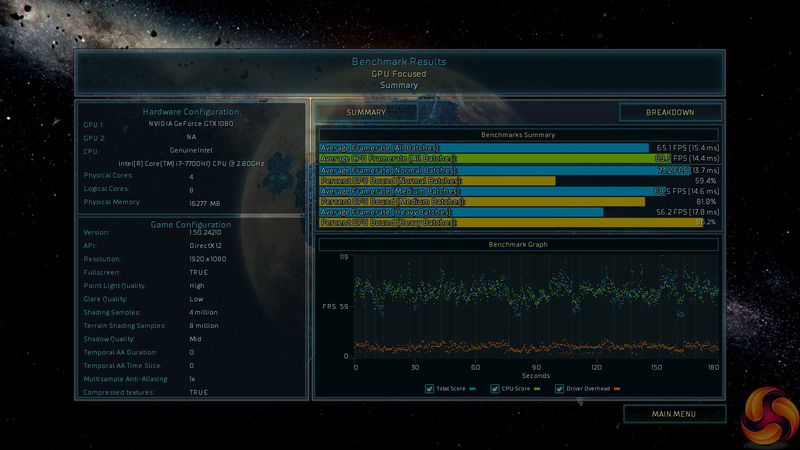 I am seeing decent gains over the the MSI GS40 and Blade laptops with the Core. 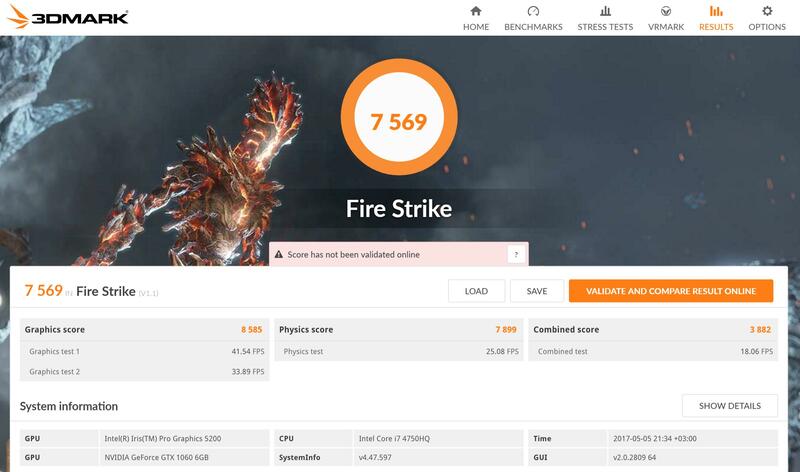 Scored a 6190 in 3DMark Ultra with the MBP+Core VS. 5989 with MSI GS40. 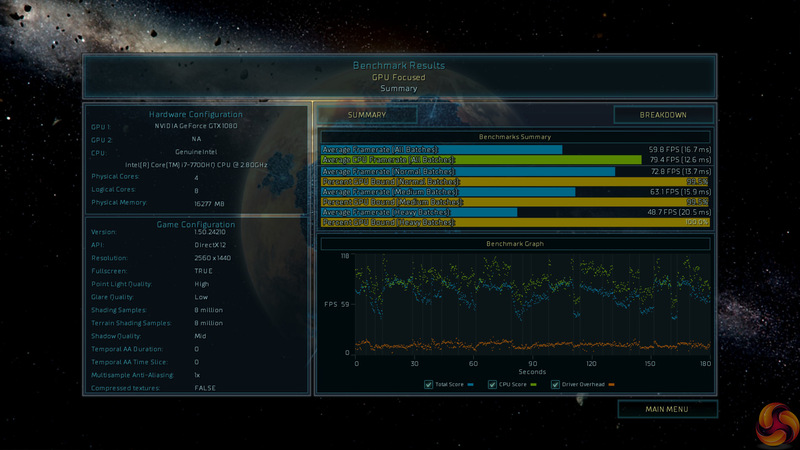 Also seeing between 10 and 15 FPS improvements in most games. 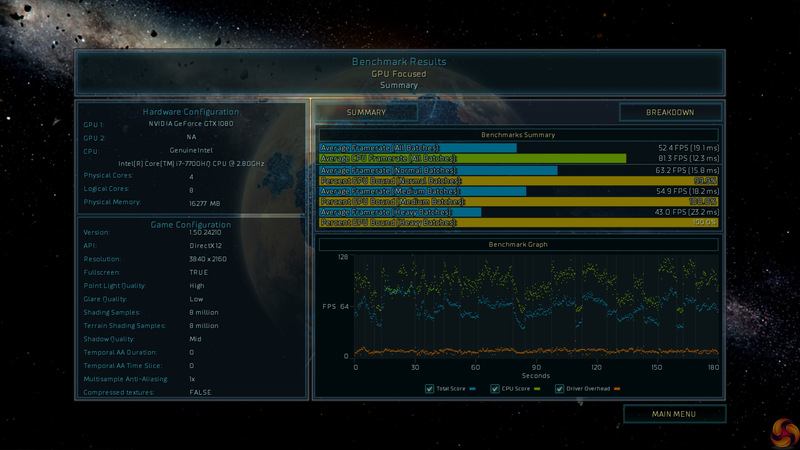 The set up scored a 2829 at 112 FPS average with Ultra and 4xAA. 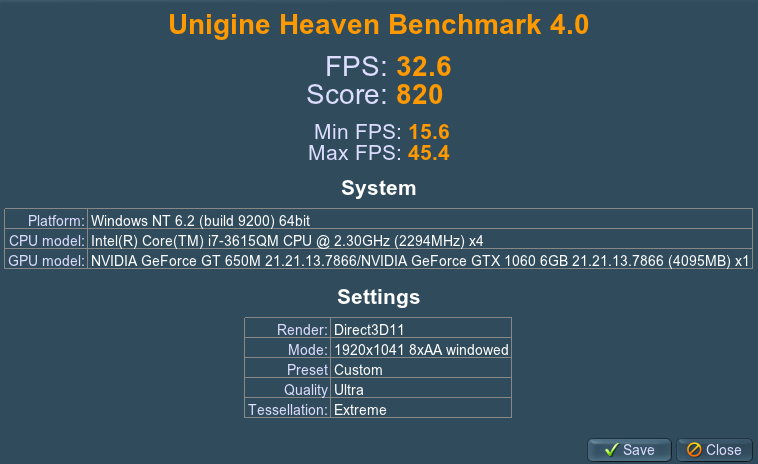 The second Heaven benchmark shows almost no degradation in scoring VS desktop. After we reach the same performance with eGPU + GTX 1060 6GB like the best gaming laptops on the market right now like Alienware 13 R3 ($1,866.85) & Razer Blade 14 ($2,099.99) with discrete GTX 1060 6GB inside. 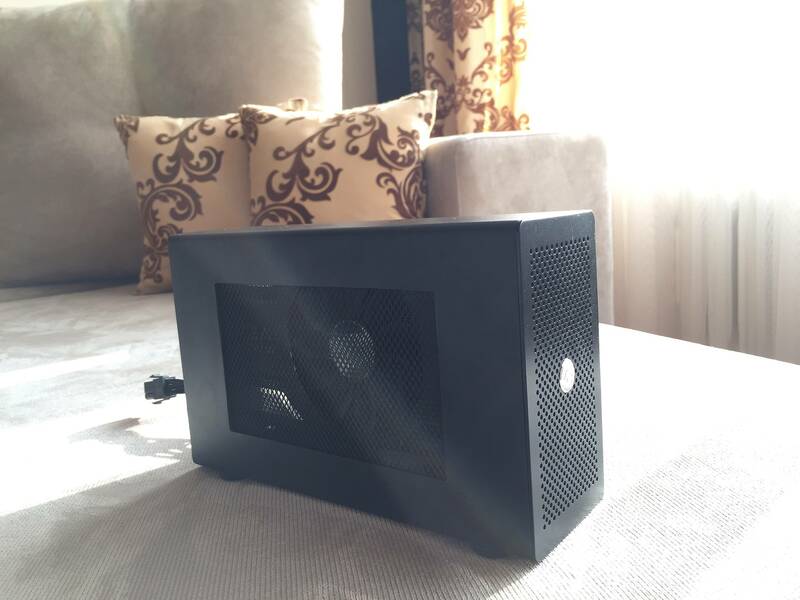 The question that many users will want to know is, what if we put the GTX 1080 8GB in our eGPU, do we will have better performance as Alienware 13 R3 ($1,866.85) & Razer Blade 14 ($2,099.99)??? 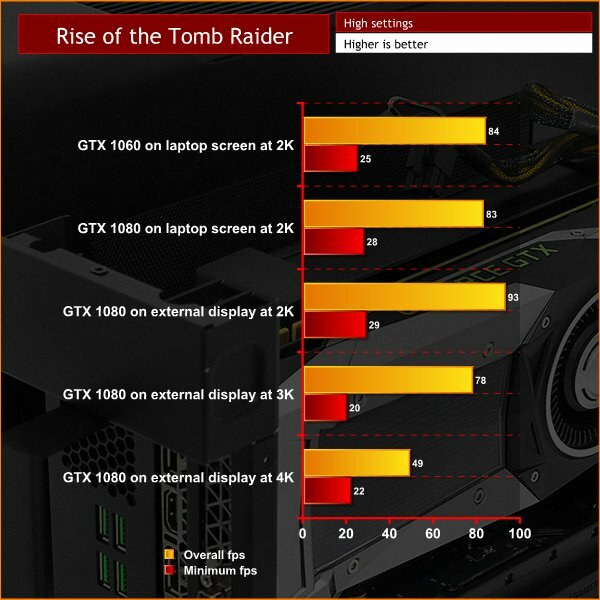 They also post benchmark pictures, and from them we can see that eGPU + GTX 1060 6GB is enough for 1080p (2k) gaming (we have the same gaming experience like if we have gaming laptop with GTX 1060 6GB inside), but if we want to up the resolution to 1440p (3k) or 4k we will need GTX 1080 8GB. 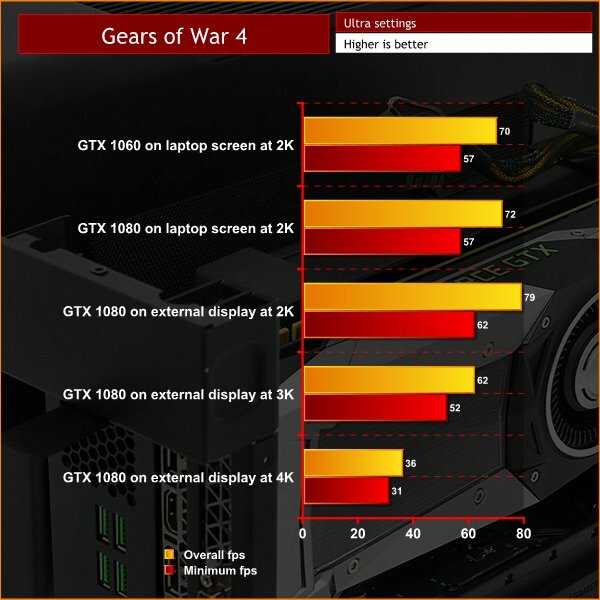 You must know that 4k Gaming with stable 60FPS is still not possible even with Desktop PC with GTX 1080 8GB. So we can finish that if you put GTX 1080 8GB in your eGPU you could play with 1440p (3k) all to max ULRA, but you will have the same performance as GTX 1060 6GB for FULL HD 1080p (2k) resolution! Intel Core i7 7700HQ in Razer Blade is 30% faster than Intel Core i7 4750HQ in MacBook Pro (Retina 15-inch, Late 2013) so the -20% lower score was expected, also the kitguru version of the game is newer, but the score is so close again! As you will see in our video the simple shift from GTX 1060 to GTX 1080 doesn’t make a massive difference to game play or frame rates. 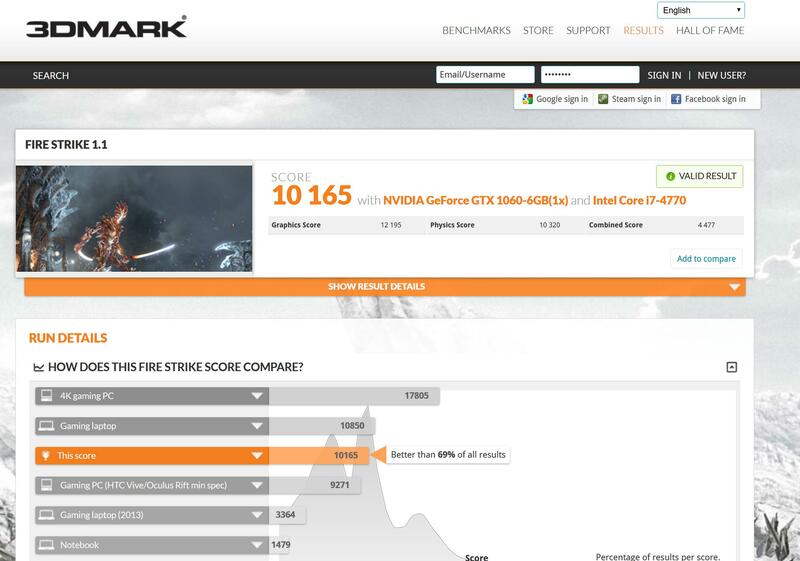 In 3D Mark you can see the graphics score leap forward but this doesn’t deliver much benefit in the real world. We started our testing with the Core and GTX 1080 powering the laptop display however this turned out to be a poor idea as the graphics data shares the Thunderbolt 3 cable with the data that is heading the other way. Disabling the laptop screen and outputting from the Core to an external display gave an increase of a handy 5-10 frames per second over the previous set-up. 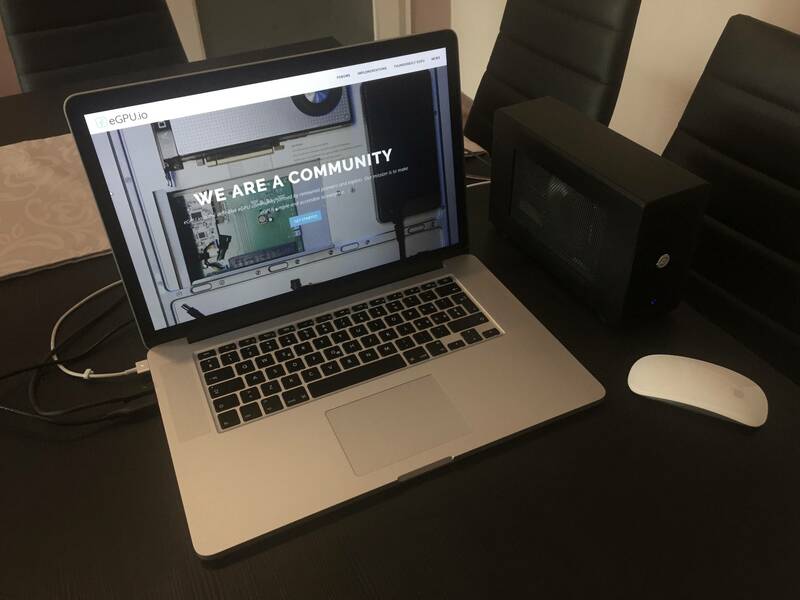 We then increased the screen resolution to 2,560×1,440 where we saw frame rates that were similar to those delivered by the basic laptop i.e. GTX 1060 on internal 2K display. Our final stop was to increase the resolution to 3,840×2,160 and weren’t massively impressed by the results as the laptop hardware wasn’t really up to the job. We had been able to comfortably play games at 1080p and now, after a massive graphics upgrade, we were now able to play the same games at 1440p! 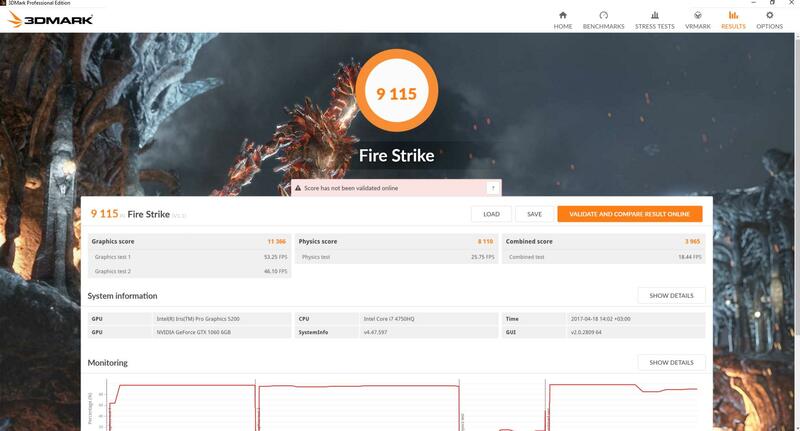 I want to add another chart for 3D Mark FireStrike 1.1, eGPU with GTX 1060 6GB = Gaming Laptop with GTX 1060 6GB - True Story! Great post @enjoy! Just a suggestion, but how about adding a table that breaks down the costs, laptop & eGPU dimensions & weight. That way readers can also compare the portability of the various solutions. Also not sure if I missed it, but what about the cost of your reference MacBook Pro + eGPU +graphics cards, cables, etc.? If that goes in the same table, then the comparison is easy to see. Maybe even come up with a metric like $ per FPS or something? Nice one, @enjoy! And with all the spare cash I can see you've invested wisely in matching funky cushions and curtains :-).